Reverse Osmosis is an advanced water filtration technique, but is it for you? Finally! A detailed explanation for the type of water filtration you’ve probably heard most about, and for a good reason–reverse osmosis (RO) treats more contaminants than almost any other filter. RO can filter out contaminants like arsenic, bacteria, lead, and fluoride. This makes it a popular treatment technology in water systems, but also at home. RO systems range from under-the-sink to point of entry (POE) installations treating the whole home’s water. If you already have an RO and are trying to diagnose a leak or a problem with your system, hop over to our handy problem-identification guide about RO system leaks. For newcomers or interested-RO owners, Tap Score created this guide to explain how reverse osmosis works, which contaminants it does and does not remove, and what some of the pros and cons of an RO system are. Osmosis occurs in the natural world and is essential to many plants and animals’ life processes (an example being when plants absorb water from soil). During osmosis, water moves across a semipermeable membrane from an area with a low concentration of dissolved particles to an area with a high concentration of dissolved particles. A semipermeable membrane is a material that lets some atoms or molecules through while stopping others–similar to a screen door letting in air but keeping bugs out. This flow leads to an equal concentration of particles in water on either side of the semipermeable membrane. Reverse osmosis, on the other hand, does not occur in nature. It requires added energy in the form of pressure to force water to move from an area of high concentration of particles to an area of low concentration of particles. The effect is to concentrate contaminants on one side of the semipermeable membrane (the waste stream) and produce freshwater for drinking on the other side (fresh water product). What does an RO System Include? Reverse osmosis itself only includes the passage of water through a semipermeable membrane. However, RO systems always contain additional pre-treatment filters and often post-treatment filters. These extra filters are referred to as “stages”. For example, if you see an RO system advertised as a 5-stage system, that means water passes through 5 stages of filtration before arriving at your faucet. Multimedia filtration/microfiltration is used to filter out sediment particles such as sand, clay, and plant matter/microorganisms. If these particles are not filtered out, they can cause fouling–they accumulate on the RO membrane and plug it up. Granular activated carbon (GAC) removes organic contaminants and disinfectants in the water such as chlorine or chloramines. Chlorine and chloramines are oxidizers and can react with the RO membrane and “burn” holes in it. Antiscalants/scale inhibitors are chemicals added to water to prevent scaling on the RO membrane. Scaling happens when dissolved compound concentrations exceed their solubility limits and precipitate out of the water and onto the membrane. A common example is calcium carbonate, or CaCO3, which occurs frequently if you have hard water. If pre-treatment is not used or maintained properly, fouling and scaling can decrease water flow across the membrane and decrease water quality. Post treatment can include an additional GAC filter to remove any last organic contaminants that still remain, remineralization/alkaline treatment, or UV treatment for bacteria. What Does Reverse Osmosis Remove from My Drinking Water? However, because all RO systems also contain carbon and sediment pre-filters, they can also filter some pesticides, algae, some bacteria & viruses, and other organic contaminants. (For a full list of RO treated contaminants click here). Though some of these small particles may be caught by the carbon pre-filters, it is not guaranteed. Increased water usage: Only 20–30% of the source water is discharged as clean water while 70–80% is discharged as more concentrated wastewater, so your water usage and bill will most likely go up. Lot of upkeep: You must be very diligent about changing all of the pre-treatment filters on time–if chlorine is in your water and breaks through, you may cause permanent damage. RO membranes must also be sent away and cleaned by a serving company 1–4 times per year. Difficult installation: A hole must be drilled in your home’s main drain pipe for the wastewater line, and in the countertop/sink for the faucet. Water pressure: RO systems can decrease water pressure throughout your house. Limited under sink space: Storage tank for treated water can take up under sink storage. Can remove too much: Reverse osmosis can filter out good minerals from water such as ion and manganese. 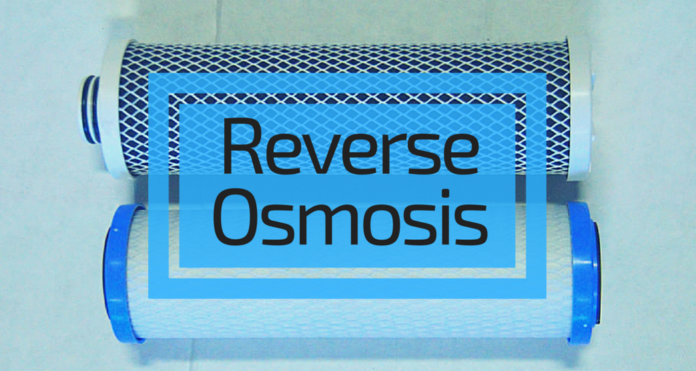 The Ultimate Question: Is a Reverse Osmosis System Right for Me? If you have a problem with inorganic contaminants such as arsenic, fluoride, or nitrates, or if you have a high total dissolved solid (TDS) count, RO is likely a great option for you. If you have multiple water quality issues that include both organic and inorganic contaminants, reverse osmosis is a good option that will cover all your bases. It is important, however, for you to know your water’s full chemical profile before installing a reverse osmosis system. Why should you test before you treat with RO? RO is expensive and time consuming–so you’ll want to make sure this is the right choice. Further, membranes can be damaged by certain contaminants present in your water, so knowing what type of pretreatment you need is essential, just like Tap Score’s Essential Water Test. Have more questions? Feel free to email us at contact@simplewater.us! Next articleDIY Furniture : LEARN HOW TO PAINT METALLIC FINISHES ON ANY FURNITURE!